Today's giveaway is a witty contemporary romance novel by debut Australian author Jean Flynn. 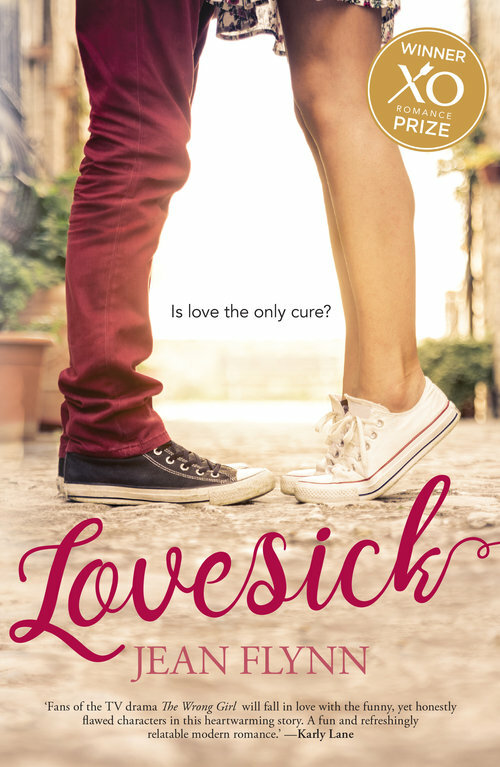 Lovesick is a big-hearted romance about getting sick, getting better and taking risks. Jean Flynn was born in Melbourne and currently lives in Ballarat, Victoria. She teaches creative writing at Federation University and Lovesick is her first novel. Being LOVESICK can be horrible. There is a cure though. Thanks Mary & Rosalie, I agree listening to music can help to cure the feeling of being lovesick. Good luck! Add chocolate (Freddo Frogs) and icecream - great distractions to that list! This sounds great Tracey. But also laughing at the reminder of the Lovesick song! I like the icecream suggestion Amanda :-) and I'm glad I could make you laugh Suzanne, I love that song! Thanks for stopping by Cozy in Texas. Good luck to you all in the draw. THanks for offering, sounds like fun! Thanks to everyone who entered, this giveaway is now closed. The winner will be announced soon.